Western blot analysis of whole cell lysates probed with c-Myc antibody followed by detection with HRP conjugated Goat anti Mouse IgG (1/10,000, STAR207P) and visualized on the ChemiDoc™ MP with 41.5 second exposure. Arrow points to c-Myc (molecular weight 57 kDa). Mouse anti-human c-Myc antibody recognizes myc proto-oncogene protein, also known as avian myelocytomatosis viral oncogene homolog, class E basic helix-loop-helix protein 39 or myc-related translation/localization regulatory factor. Mouse anti Human c-Myc antibody recognizes the Myc proto-oncogene protein, also known as avian myelocytomatosis viral oncogene homolog, class E basic helix-loop-helix protein 39, myc-related translation/localization regulatory factor, transcription factor p64 or v-myc myelocytomatosis viral oncogene homolog. The protein encoded by MYC gene is a multifunctional, nuclear phosphoprotein that plays a role in cell cycle progression, apoptosis and cellular transformation. It functions as a transcription factor that regulates transcription of specific target genes. Mutations, overexpression, rearrangement and translocation of MYC have been associated with a variety of hematopoietic tumors, leukemias and lymphomas, including Burkitt lymphoma (BL). There is evidence to show that alternative translation initiations from an upstream, in-frame non-AUG (CUG) and a downstream AUG start site result in the production of two isoforms with distinct N-termini. The synthesis of non-AUG initiated protein is suppressed in Burkitt's lymphomas, suggesting its importance in the normal function of MYC (provided by RefSeq, Jul 2008). 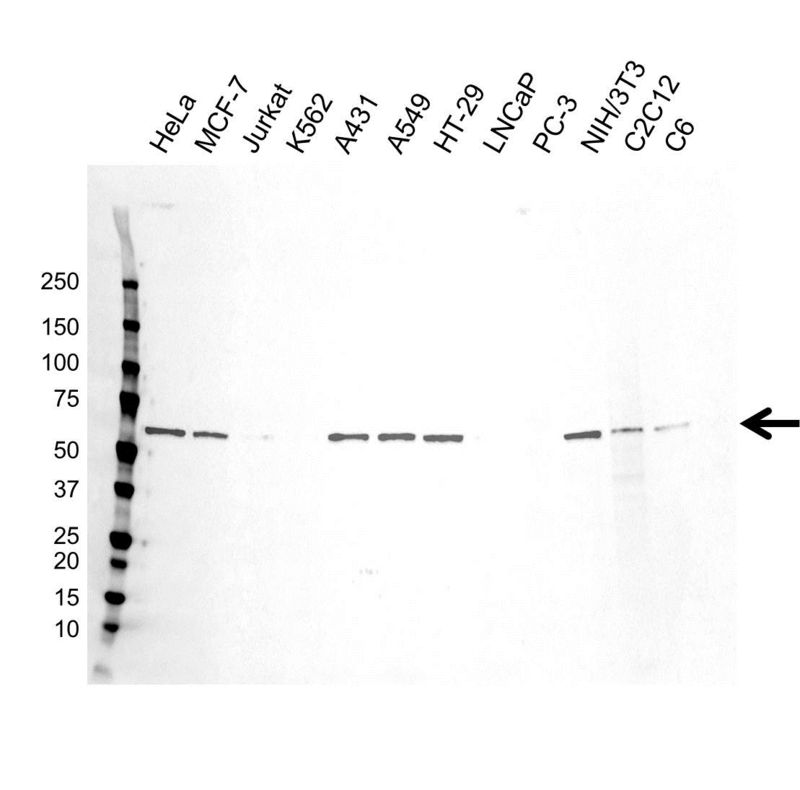 Mouse anti Human c-Myc antibody detects a band of 57 kDa. The antibody has been extensively validated for western blotting using whole cell lysates.